"We have to make it better. There's only one way to stop it." 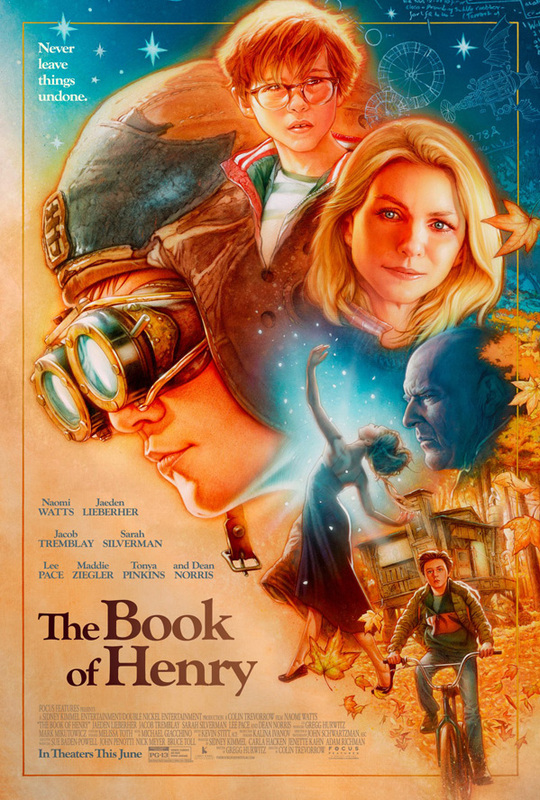 Focus Features has debuted the first trailer for the film The Book of Henry, the latest from director Colin Trevorrow (Safety Not Guaranteed, Jurassic World). Unlike his past two films, this one is a more conventional drama with real people (and no sci-fi). The Book of Henry is about a single mother raising two boys, one of who happens to be a genius. The cast includes Jacob Tremblay and Jaeden Lieberher as the two boys, along with Naomi Watts, Lee Pace, Sarah Silverman, Maddie Ziegler, Dean Norris, and Bobby Moynihan. This seems like a very nice, charming drama until - wait, Naomi Watts is a sniper now?! As odd as that twist is, I still want to watch this. The Book of Henry is the story of a single mother (Naomi Watts) raising two boys (Jacob Tremblay & Jaeden Lieberher), one of whom is a genius. After she discovers a book written by her son containing a plan to right a terrible wrong happening next door, she attempts to execute the plan, and in the process discovers new strength as a parent. The Book of Henry is directed by filmmaker Colin Trevorrow, of the films Safety Not Guaranteed and Jurassic World previously (as well as Star Wars: Episode IX next). The screenplay is written by Gregg Hurwitz. The film hasn't premiered at any film festivals yet. Focus Features will open Trevorrow's The Book of Henry in theaters starting June 16th this summer. Anyone interested?